LicensingLive! 2016 is less than a week away and the agenda item that has me most intrigued is a keynote presentation by NFL six-time Pro Bowler Terrell Owens. If “Every Business Will be a Software Business”, What Does that Mean to Me? Every business will be a software business. That’s what Microsoft CEO, Satya Nadella famously said in 2015, but he wasn’t the first. In fact it’s an idea and phrase that has now become so pervasive among the “technorati” that actually digging into it and fully understanding its meaning for the average business may sometimes become overlooked. LicensingLive, the only event dedicated to software monetization strategies for ISVs and hardware manufacturers, is right around the corner. The theme of this year’s event is next-generation monetization strategies for embracing the NOW economy. One presentation I’m particularly looking forward to is by leading pricing and monetization expert Madhavan Ramanujam of Simon-Kucher & Partners. On November 1-3, the Juniper Hotel in Cupertino, CA will play host to LicensingLive! 2016 – the most comprehensive software monetization event dedicated to ISVs and hardware manufacturers. The two-and-a-half-day convention is the highlight of the software industry calendar, jam-packed with insightful sessions from industry experts and senior software leaders. Attendees at this year’s event will discover the next-generation monetization strategies that are enabling business transformation in the NOW economy. 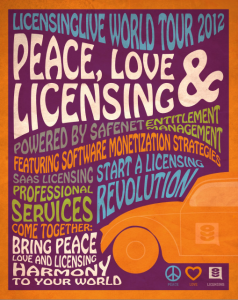 Software monetization experts will connect on October 9th and 10th for SafeNet’s annual LicensingLive conference, being held this year in Cupertino, CA. Now in its 8th year, LicensingLive! has connected software publishers with peers, technology vendors, and industry analysts to discuss the latest software licensing trends, advice, and best practices. This year’s theme, “The Evolved Software Experience,” focuses on how cloud computing has changed the experience consumers demand from their software, and will help guide how software vendors can provide an improved cloud-comparable experience while maintaining their hybrid portfolios. Are you a former flower child? Do you remember the first steps on the moon, gas prices at $.35/gallon, the classic VW bug, or Woodstock? Then, you’ll feel right at home on LicensingLive in September. Sind Sie ein ehemaliges „Blumenkind“? Erinnern Sie sich an die erste bemannte Mondlandung, an die Erstausstrahlung der Quizsendung „Allein gegen Alle“ mit Hans Rosenthal und daran, dass Gustav Heinemann als erster deutscher Bundespräsident die Niederlande besuchte? Dann werden Sie sich im September bei LicensingLive ganz zu Hause fühlen. Wir reisen zurück in eine einfachere Zeit, komplett mit Hippies und klassischem Rock, mit unserem neuen Contest „Peace, Love and Licensing“. Why choose either cloud-based OR on-premise delivery for your software, when you can do both?